Mysterious Ancient Circles! 10 Massive Circles In Jordan Seen In Hi-Resolution! Crop circles have been emerging in grain fields all across the globe. They appear swiftly and usually at night. They are elaborate and reminiscent of geometric forms and profound mathematical theorems. 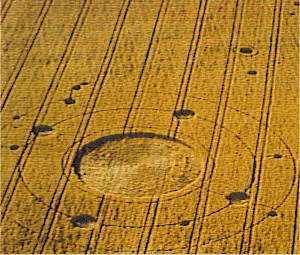 It is believed that such ‘geological graffiti’ is the work of Nephilim/Alien life forms and their handiwork has been defacing the planet for some time now; and while some of the crop circle formations can be attributed to hoaxes, others cannot be. The video below reveals bizarre notes taken by a scientist who was commissioned by the government to visit alien crash sites and observe alien life (the scientist is now in hiding). In it he exposes top secret information on how crop circles are created. I think you’ll find it rather interesting…. 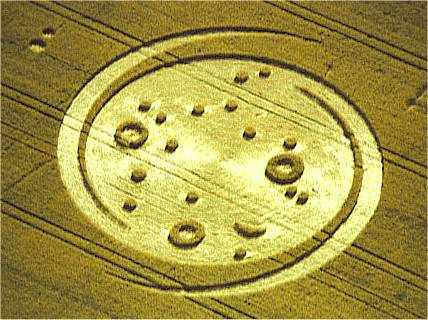 Those who claim that all crop circles formations are made by hoaxers are dead wrong! 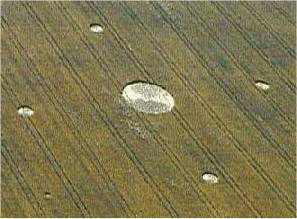 In fact, crop circles formations appeared well beyond the 20th and 21st century. In the 16th and 17th century folklore reveals stories about fairies and elves who were dancing in fields and leaving circles in the grass. 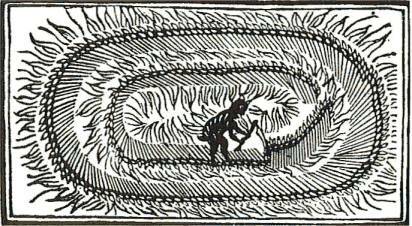 The earliest depiction of a crop circles occurred in 1678 in woodcut, which depicts a “Mowing Devil” reaping a field into a flattened circle. The story behind it claims that a farmer refused to pay the reaper his dues. As a result strange sounds and lights were seen in his filed and the following morning the farmer found his croup lying in neat circles. Much like we see today. Also in 1686 a British scientist named, Robert Plot, published a book called A Natural History of Staffordshire, in it he talked about his experiences with geometric areas of flattened plants found in pastureland. He described circles, spirals, and squares with rings. Here is one of his images from the book. 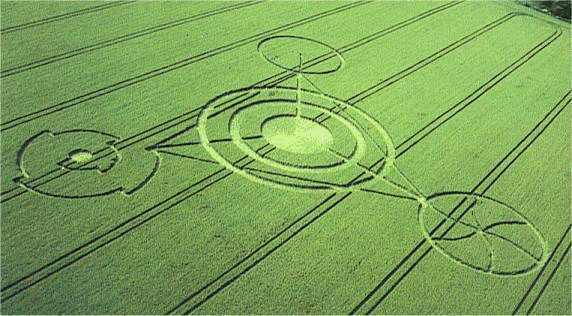 Since the 1970′s crop circle formations have increased dramatically. Here are just a few that have been seen across the countryside..
Photo Above- A quintuplet, Beckhampton, Wiltshire, 3 August 1988. Image Above- Triple ringer, Warminster, Wiltshire, July 1990. Note the seemingly randomly-placed mini-circles or ‘grapeshot’, a common feature in the early days. Image Above- Alton Barnes, Wiltshire, 11 July 1990. This huge pictogram gained worldwide publicity and attracted thousands of visitors. Image Above- The ‘Tetrahedron’, Barbury Castle, Wiltshire, 17 July 1991. The day after it appeared, a British newspaper ran a photo of the design with the headline, ‘Now explain this one’.